In the spirit of our recent posts on assembling outfits, here’s the process that put this one together. Originating idea: I’ve always liked the way this pale, silk tie from Ralph Lauren goes with my Rubinacci cashmere jacket. The corn colour of the tie picks up some of the lighter aspects of the donegal pattern. Very few plain, silk ties work with odd jackets, but this one does. So, what to wear with it? The default assumption with the shirt is it will be plain blue. It’s easily the most versatile of the shirt colours. And that works here, successfully bringing the jacket and tie together without the starkness of a white background, or the complication of another pattern. What trousers? Several could work, each with a respective level of formality, from fresco to chino. But I’m most interested in more casual combinations of jacket/tie/handkerchief; it’s just more of a challenge, and something you rarely see done well. So I went with chinos. Cream was too close in colour to the tie, and navy contrasted a bit too much with the jacket (we are playing with a very subtle colour combination above the waist, after all). So these grey/green ones from Incotex were chosen. 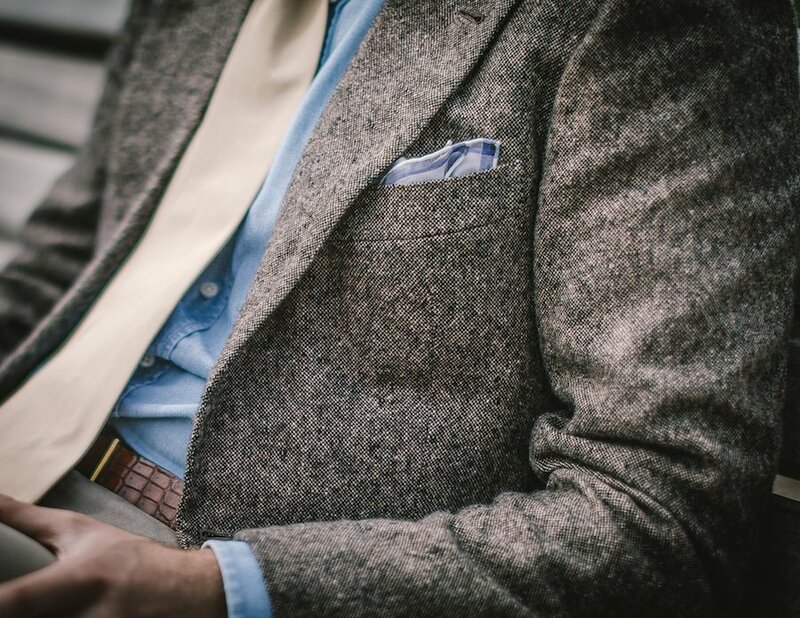 An odd jacket/odd trouser combination always needs enough contrast to tell the two pieces apart, but the degree of contrast should also be a reflection of the rest of the outfit. At this point, it seemed like there was a theme emerging. Subtle, muted colours – and perhaps a touch of the military. The pale-yellow tie is very similar to that worn by American soldiers in WWII, and I believe still worn by the Marine Corps. And the green/grey of the trousers is not far off the rest of the uniform. With that casual theme in mind, the blue shirt became a blue denim, and my Gaziano & Girling hatch-grain loafers went on the feet. Nice that the loafers, again, are not too dark and therefore don’t create too much contrast with the trouser. The book, Permanent Style 2015, is still available by the way. I think we had about 400 copies left at last count, out of the original 2000. You can buy it here. All are hand-numbered, and can be distributed from the US or UK. If you are in the UK, make sure to click ‘Estimate Shipping and Tax’ and enter the UK as the country. You will then have a ‘Promotion shipping offer’ of $7. You can follow the discussion on Casual tie and sports jacket (military donegal denim chino) by entering your email address in the box below. You will then receive an email every time a new comment is added. These will also contain a link to a page where you can stop the alerts, and remove all of your related data from the site. Interested in your choice of belt. Is it crocodile? Vintage? I’d normally think of croc leather as a bit formal/dressy compared to the rest of this outfit but it seems to do a great job of providing some contrast and breaking things up a bit at the waist. Dear Simon, did you do a post on the belt yet? I can’t find it. If not, I’m vey much looking forward to it! Sorry, no. Coming I promise! My eye too was drawn to the beautiful belt as i am not in love with the combination. Looking forward to the write-up on the belt. Very nice. Really like the denim shirt – I wouldn’t usually choose one for a look like this but it works well. Side note – I’m having a suit made by Steven Hitchcock at the moment and he showed me the fabulous looking Moonbeam cloth you’re using for your next commission. Very nice choice! Are you having any photos taken at any of the fittings? I love this series, and this look in particular. One request, however–going forward, would it be possible for you to include a picture that better shows the whole outfit all at once? It’s hard to see how everything comes together when the only full picture is of you sitting down. I had the same thought after the “Grey cashmere and brown flannel” post–I couldn’t fully appreciate the outfit until I saw the pictures in post about the jacket itself the following day. By the way, can I assume there’s no crease in those chinos? Cheers Eric, and sure will do. These outfit posts are very interesting and informative. This is a great outfit. I do like that kind of loafer; would they be appropriate to wear in black with a navy fresco suit ( w/turn-ups)? I have my eye on a pair of Alfred Sargent’s, but am not sure they’d work. It looks a touch too “muddy” for my taste, but I would kill for the coat. Perhaps swap the trousers for more of a navy, and switch to dark suede for the footwear? I think you’ve hit the nail on the head with this one. A casual look is always harder to put together. With this outfit, in my opinion, everything is balanced. 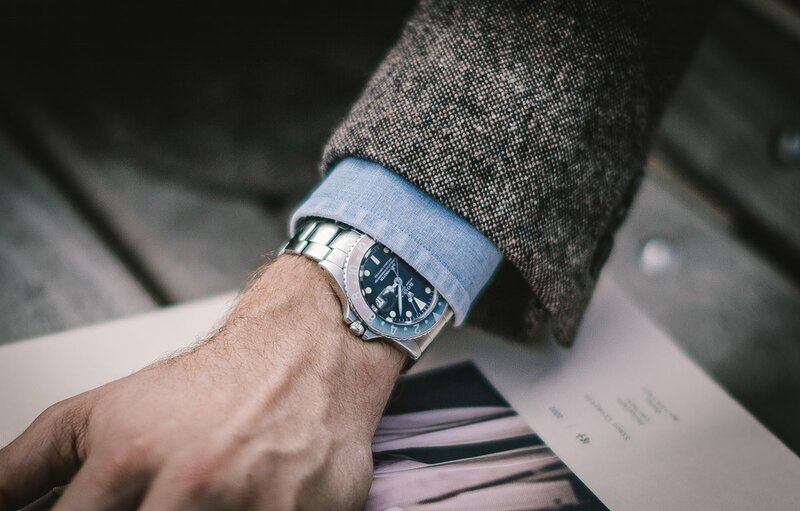 I love the jacket and chinos in this outfit (and the patina of the GMT bezel! ), I really struggle to get these softer colours right. I just find it so hard to imagine how the cloth will look when it is made up into the jacket, but I will definitely be getting a neapolitan tweed jacket. The title of this post could also have been: “Smart casual: playing with subtle and muted colors”. Putting together this kind of outfit that dodges the extrems is, to my mind, the hardest to achieve when one choose to go ahead with a smart casual! Let alone the fact that you started the entire process by pulling off first, not the jacket and neither the trousers but the least to be expected of them all, the tie!!! That is, the trickiest item to handle at the begining of such a process, obviously! Very interesting! And the end result is harmony! Simon – A lovely soft combination. Done with great finesse. I have a question about what appears to be a rather wide hem on your chinos. Intentional? If you are wearing a tie similar to USMC of WW2, where are you and what are you reading, General? What do you think of silk sport jackets? The one I have in mind is described as porous and suitable for tropics, but everything I’ve found online claims silk is wrong for humidity and gets hot? Great outfit but somewhat bizarrely, I think everything works EXCEPT the tie. It would have been perfect with a navy blue wool tie! Very nice subtle outfit. The pale tie is particularly tricky but I think you’ve balanced it masterfully with the shade of the trousers. What are your thoughts on the Rubinacci jacket now you’ve had it a while? I know you’re a fan of the Neopolitan style but I don’t recall reading that you ever commissioned anything else from him? PS It is quite funny that you can wear a denim shirt and cashmere jacket in the middle of summer in London…! You might, i know i don’t. I had to bring out my flannel and corduroy trousers over the weekend as it has been a tad nippy here. Too right! Wishing I had not been so optimistic today when donning a Smith Finmeresco. 35 degrees, 85% humidity is my situation dancing ? hours long to disco beat in full house. Thus search for lightweight jacket cloths: silk? seersucker? 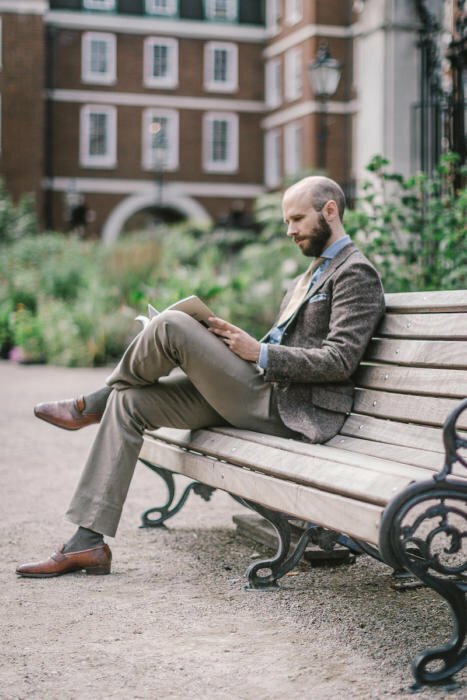 Whereas our esteemed author S.C. must keep a cool head sitting on the park bench checking his new book and discovering what he must revise in its next edition ? Brilliant combination. Yes of course a navy tie would work but it’s safe and common! I really liked this outfit, Simon. I rarely wear suits myself and it really takes an effort to try and dress well without looking over-dressed in a contemporary environment where not smart casual but rather sloppy casual is the norm. This style is more or less exactly what I’m aspiring to achieve on a daily basis. Denim shirts are one of my go-to options to accomplish that—perhaps my favorite item of clothing altogether, save shoes. Also, the jacket is really one of your best commissions altogether in my opinion. The tie is nice, solid works well and the shade is just right, but I would prefer a little more texture, maybe a silk-wool-blend? For me, a croc belt definitely falls within the category of “unusual clothing,” bordering on the dandy-esque but I think it works here as the rest of the outfit is sufficiently restrained. Also sits well with your G&G loafers which may also be just a tad too rakish for my taste, but nice nonetheless. By the way, I liked your concept of having a certain bandwidth of unusual clothing, and I do think both items are well within that bandwidth. I think suede oxfords or loafers and belt in a muted mid or possiby dark brown shade would have been a nice option as well. Great to meet you at Robin’s trunk show again, and thanks for the advice on the cloth I picked out! I’m currently looking for a vintage GMT as well, I’m wondering where you got yours and where do you think is a good place to get such vintage watches in London? Thanks Simon, if you ever feel like selling it, do let me know!